Reposted with permission from ValueInsured. 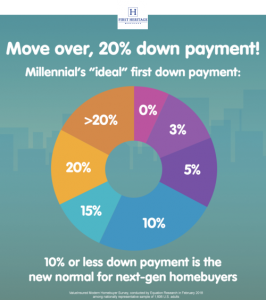 When asked about their “ideal” level of down payment, 2 in 3 (68%) millennial first-time homebuyers now say they wish to put down under 20%, according to the latest ValueInsured Modern Homebuyer survey. Naturally, what is “ideal” is subjective and personal, and may not always align with reality. According to a report by the National Association of Realtors last year, 60% of first-time homebuyers put down 6% or less down payment. However, it is important for mortgage lenders, housing professionals and even sellers of starter homes to know where new homebuyers stand; having a better understanding of their ideals could be good for business, and facilitate smoother sales transactions. According to ValueInsured’s latest quarterly results, 7% of all millennials first-time homebuyers, if given the option to choose, hope to put down zero percent down; another 26% ideally wish to put down 3-5%. In other words, 1 in 3 (33%) believe their ideal down payment is up to 5%. Most cite the eagerness to buy immediately as their motive, and express an understanding that they could potentially be paying a higher interest rate and will pay higher monthly mortgage payment after having a lower down payment commitment. To 1 in 3 next-gen homebuyers, that is considered the ideal trade-off. Interestingly, 12% surveyed said they could afford to put down more, but would prefer to put down less on a home purchase in order to free up capital for other investments. It would be interesting to monitor this sentiment as home mortgage interest rates gradually move up from recent lows. Replacing the traditional 20%, 10% down payment appears now to be the new normal, at least when it comes to ideals. Nearly 1 in 4 (24%) chose this level; another 11% chose to put down 15%. Fifteen percent surveyed chose 20% down payment as their ideal, while another 17% chose over 20%, making first-time buyers who wish to put down 20% or more a minority (combined 32%). Nearly all who chose this level shared they wish to save longer to buy in order to have a lower monthly payment down the road. 10% say they can afford to put down more because they are getting a cash gift to supplement their own down payment savings. There is no obvious pattern of contrast that indicates an urban-suburban divide in how much first-time buyers wish to put down for their down payment. Rural residents have a slightly higher tendency (+4 percentage points) to prefer a 0-5% down payment compared to their urban and suburban counterparts. Home purchase budget is inversely proportional to the level of desire to pay a 0-5% down payment. Millennial first-time buyers who self-identify as a recent immigrant are among the least likely segment to choose a low down payment; only 2% chose to contribute 0%, and 41% (+9 percentage points over national average) choose 20% or more as their ideal down payment. We have seen in our previous surveys that recent immigrants tend to express more traditional home-buying sentiments, including a stronger preference for big-bank lenders over non-bank lenders. This latest finding could be a holistic component of their more traditional home-buying mindset, could be a reflection of home-buying patterns in their native cultures, but it could also signal an opportunity to educate this segment of homebuyers, who may not be aware of the option to put down a lower down payment, or of other home-buying innovations.